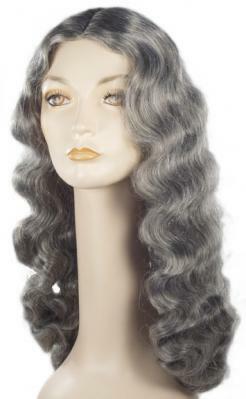 A wig that is much like the UMA Long Wig but with some other features included, this grandma wig is something that makes a young woman get an older, grown up look. The hair is wavy with a flat top. The hair is much wavy than the UMA Long Wig and shorter, too. We call this the grandma because of its old appearance. The mixture of a few black strands with partially black ones and completely white ones makes this disguise element real-to-life. Grow old before time makes you.